You can directly book an appointment with Dr. Khare and Dr. Trivedi online. This is a 20 minute appointment to discuss the the benefits and risks of Ketamine, your medical history, vital signs and any tests that may be needed to prior to your Ketamine treatments. We will answer all your questions and explain everything about the procedure, goals, and long term behavior changes. We take insurance for this visit (if you do not have insurance, our self-pay fee is $175). We will then schedule you for an appointment. Sometimes we can start that day, but normally, we schedule your series of infusions. Depression, Anxiety, PTSD, and chronic pain can be severe and debilitating. Currently, patients are being treated with various oral medications such as SSRIs, mood stabilizers, benzodiazepines, neuroleptics and narcotics. Some patients achieve success with these traditional therapies, while many do not. We offer cutting-edge Intravenous Ketamine treatments for refractory Depression, PTSD, OCD, Fibromyalgia, RSD/CRPS and other chronic pain conditions via IV infusions as well as nasal treatments. Ketamine is an anesthetic medication that has been used since the 1960s with an excellent safety profile. In the last two decades this medication has been increasingly studied for its ability in alleviating symptoms related to depression, mood disorders, and chronic pain. Studies completed at multiple large and reputable academic institutions have shown great outcomes for patients who have not previously had good results with standard therapies. We pride ourselves in doing our best to take care of the individual needs of our patients. This treatment is about more than just the medicine. It is a positive change for your life, but those changes require quite a bit of guidance. We know how to counsel you and will take the time to guide you to prevent any of the pitfalls while recovering from mood and pain disorders. Your first treatment will be a discussion of your past medical history, a discussion of ketamine, going over treatment plan and goals, reviewing the risks and benefits of the procedure and answering all your questions. If you have insurance, we do accept insurance for this visit. Patients typically receive a series of 6 infusions over the course of approximately two weeks for mood disorders. Each infusion typically lasts about 45-55 minutes. Most clinical trials have consistently shown a 70-75% success rate with this approach. The treatment does require booster infusions as time passes to keep the effect going and to keep patients symptom-free. These boosters are the same duration and are usually done once a month. The first 2 weeks of treatment are intense (we do appointments Monday, Wednesday, and Friday – and then do this again – 6 appointments in 2 weeks). We have these appointments from 8am to 1pm. You have to make arrangements for work/school. There’s just no way around this. We urge you to do 6 treatments in 2 weeks, as this is the scientific protocol with the highest success rate. Many of patients try to adjust the protocol, but we urge you to follow it the best you can and make arrangements with work or school. With the exception of your 1st treatment, you will be able to go back to work on the same day (but give it an hour or so after your infusion). Each infusion lasts 45-60 minutes. Allow 1.5 hours for the entire visit. You cannot be behind the wheel (no driving) from Innovative Express Care after the infusion. Uber, Lyft or Taxi by yourself is fine. We are one of the only clinics in Chicago that take insurance. Since insurance does not pay for the actual Ketamine administration because it is not FDA approved, we do charge you $250 per infusion for the Ketamine infusion and we then bill your insurance for the visit, time with the doctor and IV insertion. Yes, if we take your insurance (check here), we will bill your insurance. So, you will pay: $250 + whatever your insurance will not cover, up to $350. The treatments for Depression will never be over $600 per treatment, and after you hit your deductible, will be $250 per visit. For Mood Disorder (depression/anxiety), treatments consist of a series of 6 treatments over a 2-week period. Each IV infusion lasts approximately one hour. Chronic Pain Disorder Treatments are more intense and last 2-3 hours (with much higher dosages) and usually consist of a series of at least 3 treatments depending on the type of pain syndrome you have, but may require as few as 3 or as many as 6 total sessions. We accept all major credit cards, CareCredit, and cash. No checks accepted. On the day of each infusion, ideally, you will need someone to accompany you to your appointment and drive you home as the ketamine will leave you a little tired. If needed, you may take an Uber, Lyft, or Taxi home after waiting an hour after the infusion. Please wear comfortable, loose clothing so we are able to easily place the cardiac monitor leads under your shirt. Try to come to the appointment in a good state (non-stressed). Infusion times vary depending on the disease we are treating. We will pretreat you with nausea medication (Zofran) when you first arrive to the center, as Ketamine can cause some nausea in a minority of patients. We ask you to eat something light, and if you eat, please make sure it is two hours prior to infusion. Most people find the ketamine infusion experience to be pleasant. Infusions are given in private, spa-like rooms. Patients do not usually sleep as the dose given is lower than an anesthetic dose, but you go into a dream-like state (in-between dreaming and being awake, where you can control the dream). The infusion for mood disorders generally lasts about 45 minutes, while for pain disorders, can be 3 hours. Most effects of the medicine wear off within minutes after the infusion, but patients can feel more tired than usual for a few hours after the infusion. Ketamine is generally well-tolerated, but if any side effects are encountered such as visual disturbances or elevated blood pressure, our staff will quickly give IV medications to counteract them. After the series of 6 infusions are completed, the duration of symptom relief can be variable. Most patients will feel well for 1 month, but some can respond for up to 2-3 months. Single booster infusions can be scheduled to achieve symptom relief again, and generally, are made every month. 1 Infusion every 4 weeks for booster (this can vary from every 3 weeks to every 6 weeks… Everyone is different). This usually goes on for 11 months or so. We do use Nasal Ketamine to help prolong the monthly IV Ketamine needed. We can discuss this protocol at your first consultation. Not yet. Over the past two decades dozens of studies in prestigious medical centers and The National Institute of Mental Health have proven ketamine’s safety and efficacy in treating major depressive disorders, anxiety, obsessive compulsive disorders and suicide ideation. Yet, without very large controlled studies generally required by the FDA to get approval for any psychiatric drug, approval has been delayed. Since ketamine is a generic drug, no pharmaceutical company will spend the hundreds of millions of dollars required for such a study. 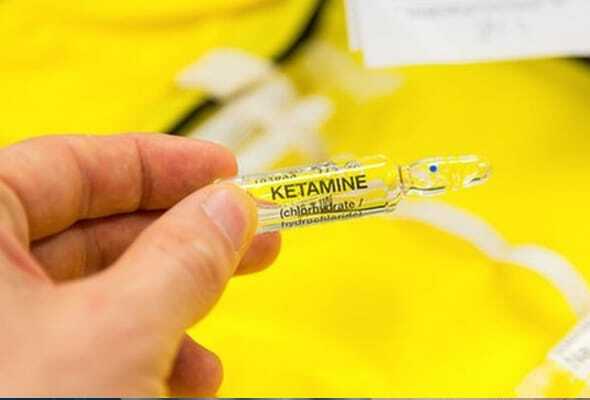 Efforts are being made to create a national registry of the outcomes of the thousands of patients treated by ketamine providers across the country to date. This data will be used to expedite FDA approval. In the meantime, ketamine is being used “off label,” as is true with many other medications prescribed by physicians. Insurance doesn’t cover ketamine therapy because it’s not FDA-approved for use on depression. In order to obtain approval, the FDA requires extensive trials that are hugely expensive, costing millions of dollars. No one is willing to fund these trials, because the cost can never be recovered. Ketamine is a fairly inexpensive generic drug that creates only a small profit margin for manufacturers. FDA approval won’t change those economics. Since ketamine can’t produce blockbuster profits, no for-profit corporation is going to invest millions in FDA trials. A total of 6 Ketamine infusions are recommended within a 14-day period. That will maximize the ketamine effect on new dendrite and synapse growth. Thereafter, patients are placed a maintenance program where they return when they feel it necessary for a single infusion booster (usually once a month). During the maintenance period, the duration of relief following the initial infusions and the first booster, and between subsequent single booster infusions varies between patients. The average duration of relief between booster infusions is 3 to 4 weeks. There is no way to predict what your needs will be. We recommend everyone does at least 5 infusions before terminating. If you do not feel any effects after 5 infusions, we deem you a non-responder. This happens 15-20% of the time. It is frustrating both for you and Innovative. No, right now ketamine infusion therapy is, perhaps, the most exciting and successful new treatment for severe depression. But there are large pharmaceutical companies developing ketamine-like drugs for more convenient nasal and oral administration. It may be a few years, but those drugs will become available. In the meantime, IV ketamine has been proven effective in most cases, and is available to you or your loved ones. Patients with debilitating severe depression with constant thoughts of self-harm cannot afford to wait. Please book a consultation to understand if it is the right treatment for you. About an hour, with an additional half hour before discharge. No. The dose of ketamine you will receive does not cause loss of consciousness. Most patients experience a significant “dissociation” or inner reflective experience that is well tolerated. When Dr. Khare asks his first time patients to describe their infusion, the patients overwhelmingly say things like, “I was tripping” or “wow, that was beautiful” or “that was the strangest experience I have ever had” or “I was tripping by #$@# off.” The literature also states that the Ketamine dissociation is very similar to other psychedelics, such as mushrooms and LSD. If you find it unpleasant we can slow down or stop the infusion. Of note, you are ALWAYS in control. If you want the infusion off, just call our name, and we will come in to evaluate you and will do whatever you tell us to do. Although we will stop the infusion, we will encourage that we re-start it after sitting with you and calming you down. Yes. The benzodiazepines, such as Klonopin, Xanax, Valium, and Ativan do interfere with ketamine if used daily and at higher doses. We recommend decreasing the dosage when getting Ketamine treatments. Usually, there is a natural decrease in usage after beginning the Ketamine infusions because the patients are less anxious. Lamictal (lamotrigine) in doses above 100mg/day also can block ketamine efficacy. We still recommend you continue your Lamictal, however. We will have a discussion about this at your first appointment. It is not a contraindication. No, other antidepressant medications do not interfere with ketamine’s mechanism of action. Are there antidepressant or other medications that I should stop? Yes, if you are on Lamotrigine (lamictal), we ask you to not take your daily dose until after the ketamine infusion. Patients on this medication need a significant amount more of ketamine to attain our goal of a dissociative state. So, while it is not life threatening, the ketamine infusion may not work as well. Click here for a great little article on this. If you are on a benzodiazepine (Valium, Xanax, Ativan, Klonipin), we ask you to not take it the night before or the morning before your infusion. This is not an absolute, so if there is a reason to take it, then you can take it, just let us know about it. These 2 types of medications are the only major medications that interfere with the Ketamine treatment outcomes. SSRIs should be taken regularly. Please do not stop any prescribed, daily medications because you are starting Ketamine infusions. Talk with our physician about your medications and we will advise you. Almost none. Uncontrolled high blood pressure or heart failure need to be corrected. No, ketamine has been proven safe in humans over five decades in and out of hospitals and battle fields for surgical anesthesia and trauma management. Those patients experience longer exposures and at much higher doses than those used to treat severe depression. Although it has been abused recreationally in high doses as a club drug, there is no evidence that ketamine is addictive. If Ketamine therapy works, how soon will I begin to feel better? For mood disorder patients, there are patients who report feeling better immediately after the infusion. These are usually patients who have ideas about self-harm, suicidal ideations, or other extreme feelings. Other patients may not notice any improvement until their 3rd or even 4th infusion. Yet others will feel better only after their 6th infusion. We encourage patients to do all 6 infusions because there are a subset of patients that are “late responders” and we have seen a switch in them late in their infusions. For pain patients, it is uncommon to see a significant relief after the 1st or 2nd infusion. Usually, we see significant pain reduction after their 3rd infusion. We see significant and lasting relief when at least 3 infusions are done. I’m Bipolar, will this get me into a manic state? Hypomania or a manic state is always possible when helping patients out of the depressive state of bipolar disorder. However, in our experience, we have not seen this. We feel it is very safe in bipolar disorder. Do I need a referral for this treatment? If I do have a psychiatrist or psychologist, do you talk to them? You do not need to be referred to our clinic to be seen. If you have a psychiatrist or therapist and you would like us to share your experience with them, please let us know and we will call or send them your medical records. Usually, after your ketamine treatments and after you see them, they are extremely interested in Ketamine. Where do I get the infusions and what is it like at Innovative Ketamine?